This mural Sticker is printed on Repositionable Wallpaper and is easy to install. Ready to 'order and print' - or you may customise it. 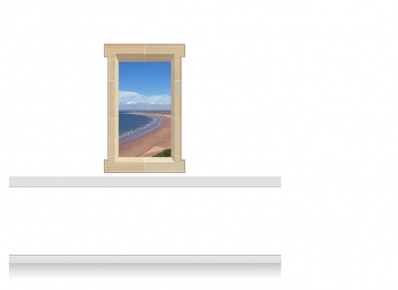 This Window Mural Sticker includes a photographic scene from our own Collection, and it is ready to print. However, you may choose to customise it with an alternative scene. Please view the How To Customise Tab to see how you may personalise your mural. This self-adhesive Sticker is 90cm wide and 142.5cm high. It is intended for installation on pre-painted walls above the dado or handrail. You may trim it to fit your wall space perfectly. View the Details Tab for more information. You may choose a different ‘scene’ within your mural. This may be an alternative scene illustrated in any other Scenic Mural product, or a ‘scene’ of your own. This may be a photo chosen from an on-line photo library (for which a usage charge may apply) or a photo of your own. It really is very easy to install ourStickers. All you need are some basic DIY skills and tools to achieve perfect results. Click the ‘Layout Diagram’ picture for your selected mural product to view an outline drawing with all critical dimensions shown. You can download this diagram on the Information Tab. You can use this information to verify the fitting and setting out of your mural onto your wall space. Successful installation is easily achievable using a few basic tools. 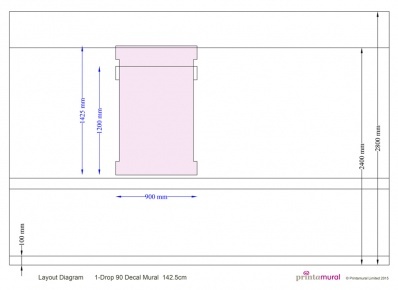 For your guidance, full Instructions and a Setting Out Diagram are supplied with every mural product. You may also view and download our How To Install Guides that include a list of the tools you will need. These instructions also suggest how best to prepare your wall and door surfaces for installation. Please also refer to our material specifications for information about suitable wall finishes. Simply locate the ‘drop’ in the correct position, gradually peel the backing paper away and down, and smooth the wallpaper down as you go. For murals comprising more than one 'drop', adjacent ‘drops’ are applied overlapping eachother and then trimmed through the overlap to provide a seamless joint. Our Repositionable Wallpaper may be re-applied if you do not get it right first time.